Who Invented the Computer Flash / Jump Drive? - Who Invented? / COMPUTING / Who Invented the Computer Flash / Jump Drive? Dov Moran – The Israeli entrepreneur Dov Moran invented of the USB Flash Drive in 1999. The USB Flash Drive can also be referred to as a pen drive, a thumb drive, a jump drive, a memory unit, a key chain drive or a data drive. The thumb drive being the most apt as the drive is usually the size of a thumb and connects to a computer via a USB port. It is a portable data storage device. Dov Moran owned a company called M-Systems which he instructed to start working on the USB storage device in 1998. This was in response to the newly created and agreed USB standard which had been implemented by the USB Implementers Forum. The forum consisted of members from major computer technology companies like Intel, Apple, Microsoft, Hewlett-Packard, IBM and Compaq who wanted a standard protocol for connecting external devices to computers. Prior to this standard being created computers were starting to have multiple types of ‘ports’ incorporated to accommodate the increasing variety of external device attachment mechanisms. The acronym USB means Standard Serial Bus. The USB 1.0 standard port was first manufactured in 1995 and has featured the same standard socket ever since, even though the technology to connect through that socket has changed to become faster over time for example USB 2.0 in 2000. The invention of the Flash Drive is controversial because the first commercially available storage drive called the Thumb Drive was released by the Singapore based company Trek Technology earlier in 2000, before the DiskOnKey product. Many different law suits have been lodged against different companies since then but Dov Moran has been upheld as the inventor through them all to date. 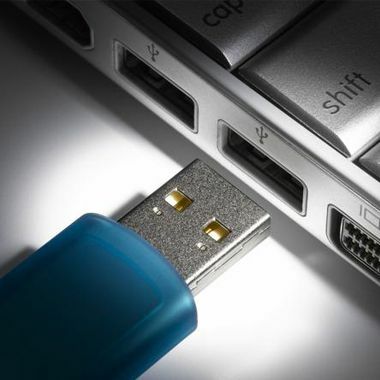 The latest USB technology developed in 2007-8 is that of wireless USB which is a high bandwidth radio technology which enables the computer to communicate with external devices such as printers, cameras and smart phones, though this technology works best at close range.